PanARMENIAN.Net - Swimmer Vahan Mkhitaryan was selected as Armenian team's flag bearer for the Opening Ceremony of the 2016 Summer Olympics, which runs from August 5 to 21 in Rio de Janeiro, Brazil. The president of the National Olympic Committee of Armenia, Gagik Tsarukyan, announced the decision during a meeting with reporters and the Olympic delegation. 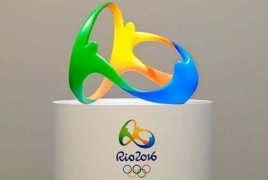 Rio 2016 Games are the 31st edition of the Summer Olympics. The official opening ceremony of the Olympics will take place on August 5. The event will run through August 21 with days 10.500 athletes from 205 countries of the world set to compete for a collection of 306 medals. For the first time in the history of independent Armenia, 33 athletes will represent the country in 8 Olympic sports.